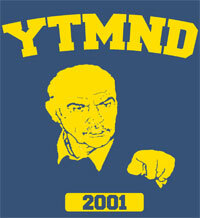 Greetings and welcome to the first YTMND T-shirt design contest! Sorry for the delay, I just wanted to make sure we had all of the specifications right. I have yet to decide how many different designs we are going to print for now, but that shouldn't stop you from entering multiple times! This contest will run an extra week to make sure there is ample time for everyone to enter! - 3x Shirt printed with your design. - 1x Limited edition Black-on-Black YTMND original shirt. - 2x Shirt printed with your design. - $20 of sponsorship money.